Stimulite Sport Seat Cushion, manufactured by Supracor, is specifically designed for athletes or athletic individuals, as it features a low profile with a planar design. In fact, this composition allows optimal positioning and comfort for even the most active of users. 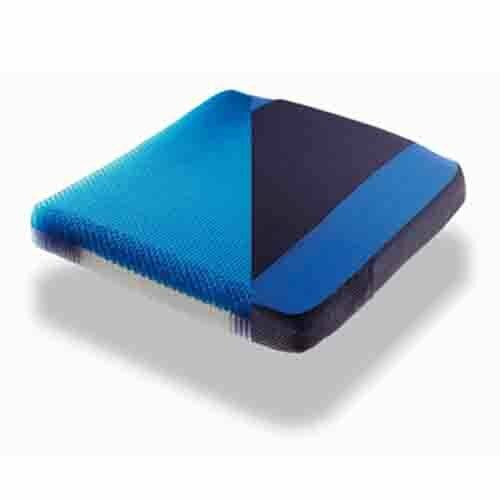 The Stimulite Sport Seat Cushion is dissimilar to other seat cushions because it fuses a cushioned top layer to a considerably firmer, robust base made of malleable Stimulite honeycomb, an adaptable cellular matrix to manage temperature and moisture. By regulating moisture and temperature, you are hindering the development or advancement of decubitus ulcers, generally known as pressure sores or bed sores. In addition to the Stimulite honeycomb design regulating temperature and moisture, it also features built-in bolsters that absorb shock, improve support and stability, exactly what every athletic enthusiast needs. To sum it up, the Stimulite Sport Seat Cushion offers an athlete unsurpassed pressure relief, shear force reduction and superior ventilation. The accumulation of each feature renders an exceptionally comfortable and, as Supracor states, "cool&qout; chair cushion for competition or everyday use. Supracor secures comfort in this pad, the Stimulite Sport Seat Cushion, by creating it out of thick and plush layers. In addition to featuring thick, shock absorbing layers, this seat cushion is incredibly lightweight, weighing in at slightly more than 2 pounds. Additionally, as with the entire line of Supracor cushions, the Stimulite Sport Seat Cushion is machine washable. To effectively assuage discomfort and prevent decubitus ulcers, bed sores and pressure sores, order this long-lasting, yet comfortable and supportive seat cushion for your active lifestyle today! Absorbs shock and provides support/stability. Low profile with a planar design. Perfect for athletes or athletic individuals. Product Numbers: SP1416, SP1616, SP1618, SP1816, SP1818, SP1820, SP2016, SP2018, SP2020.